Prime Minister Recep Tayyip Erdogan said Thursday that members of a "terrorist organisation" were taking part in deadly anti-government protests sweeping Turkey and refused to cancel a controversial development plan that sparked them. "Among the protesters, there are extremists, some of them implicated in terrorism," Erdogan told reporters in Tunis on the final day of a north African tour that has been overshadowed by the unrest back home. "Supporters of this terrorist organisation were present" including some who acted in Istanbul's Taksim Square, epicentre of the protests, he added. Seven foreigners implicated in the unrest have been arrested, Erdogan said, without specifying what part they had played in the violence. Six were arrested in Istanbul and one in Ankara, according to the interior ministry. "Seven foreigners have been implicated in the unrest, six of whom have appeared before the public prosecutor and one of whom is under arrest," Erdogan said. Later in Ankara, Interior Minister Muammer Guler said the foreigners detained were two French, two Iranians, a Greek, a German and an American, and that two had been released, without saying who. "The authorities have decided to deport four of these foreigners, and one of them is still in custody," he said. Since last weekend, thousands of angry demonstrators opposed to the conservative policies of Erdogan's Islamic-rooted Justice and Development Party (AKP) have taken to the streets of Turkey's main cities calling for him to quit. A heavy-handed police response to a peaceful demonstration against the redevelopment of Istanbul's Gezi Park next to Taksim Square was the initial spark for the nationwide unrest that has now claimed three lives. 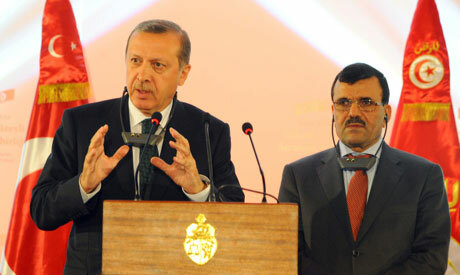 Erdogan has previously defied the protesters, dismissing them as "extremists". "We will not allow a minority to dictate to the majority, nor will we accept the tyranny of the majority," he said on Thursday, while defending the urban development plan. "We will go through with this project... (which) respects (Turkey's) history, culture and environment." "What we are doing is to protect the rights of the majority and to preserve the beauty of Istanbul," Erdogan said, adding that he did not link the environmental activists to the unrest. "We know very well who is implicated in the troubles, and I exclude all citizens concerned about preserving the environment." The embattled premier was due back in Turkey later on Thursday after his four-day trip, which also took him to Morocco and Algeria. Speaking in Morocco on Monday, Erdogan said the situation in Turkey was "calming down" and that the problems would be resolved by his return. But the mass unrest has only intensified in his absence, with doctors reporting thousands of injured as police tried to quell the rallies in major cities with tear gas, pepper spray and water cannon. A Turkish policeman died in hospital on Wednesday hours after being injured in a fall while chasing anti-government protesters in the southern city of Adana, the private NTV news channel said. His death marks the first police fatality in seven days of clashes, with two young male protesters killed earlier. Fresh violence broke out in the capital Ankara overnight but Istanbul, where the unrest started on May 31, was relatively calm after six nights of unrest.